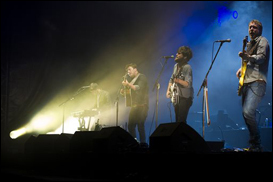 TROY, Ohio (CelebrityAccess MediaWire) — Jam Productions has picked up the tab of more than $44,000 owed by Troy City Schools for expenses related to the Mumford and Sons Gentlemen of the Road Stopover music festival. Troy was one of hundreds of communities that applied to be two-day stops on the band's North American tour on Labor Day weekend, which was staged at the town's high school. The $44,200 from Jam, the show's promoter, went to cover cleanup costs, transportation, preventative and post-concert field repairs, facility rental and miscellaneous damages among other expenses.